December 4 sees this year's only supermoon. This is when the moon moves especially close during its orbit around the Earth, resulting in a larger and brighter than the normal moon. Normally there are up to 3 supermoons in a year, but in 2017 there will only be one. What Exactly is a Supermoon? Once you start talking about supermoons a degree of controversy comes into play. The problem is that a supermoon is not a term used by astronomers on the grounds that they are not a super fun group of people in general and avoid too many cool names for things. The definition I tend to go with is the perigee full moon, where a perigee is the part of an orbit where the two objects are closest. Perigee can occur at any time of the moon's phase, but this yea,r there is only one perigee event while the moon is full. Therefore only a single supermoon. During a supermoon, the moon is objectively larger. But the weird thing is, the size that the moon appears is mostly an optical illusion, so for the casual observer the size of the moon won't really appear larger for the supermoon. You may have noticed that the moon will appear larger closer to the horizon and smaller up above. Though in reality the moon doesn't change in size based its position in the sky. But what will happen is that the moon will be brighter and the best way to enjoy the supermoon is to head out somewhere dark and unlit to find it bathed in moonlight. You can do this at beaches, parks or out in the countryside. On December 4 the moon will rise at about half and hour after sunset. This should mean that the moon will sneak up over the horizon just as the last light of the sun is fading. The times given below are for the evening of December 4, but the moon will appear full and bright for a few days around that date. Remember roughly speaking the moon will rise an hour later each day if you want to make an adjustment for a different day. In Queensland, this will be just after 7:00 pm with a sunset around 6:30 pm. The moon will be at its highest at around 12:30 am and set the next morning just after 6:00 am, well after the sunrise at around 4:45 am. 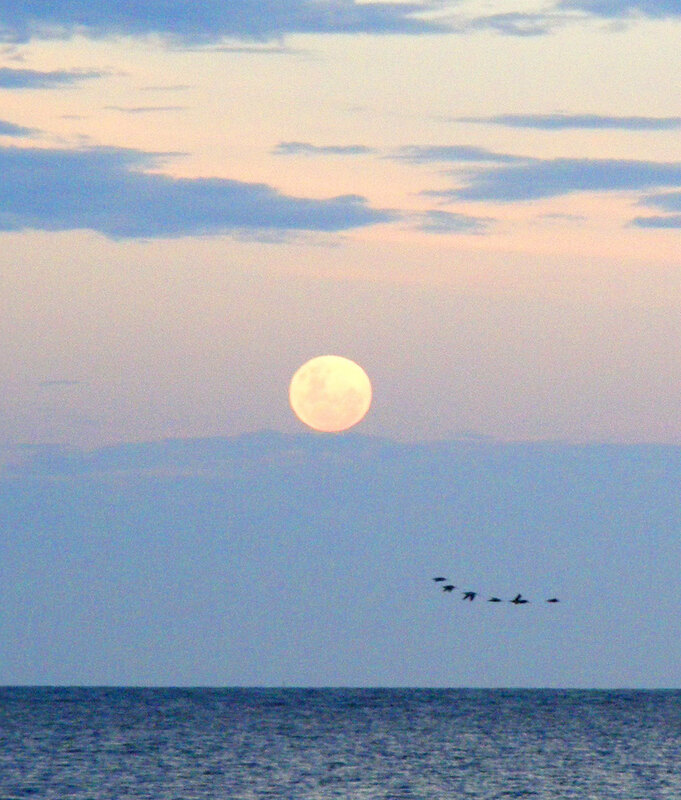 One of the most popular activities is watching the supermoon rise. The basic rule is to find a nice spot with a great view to the east. The moon will rise at 70°, which is about 20° north of true east, so you should take that into consideration when looking for the best place to watch the moon come up. Many people seek out spots on mountain tops or by the sea. Below are some suggested locations around Queensland. 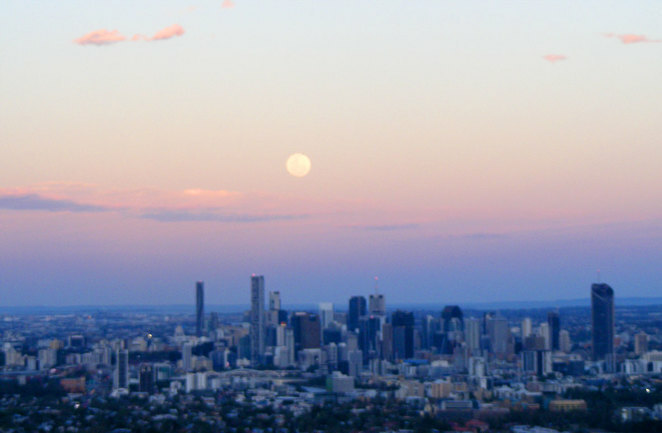 Brisbane's Mt Coot-tha can attract quite a crowd waiting to see the supermoon rise. Get in early and bring your own snacks as the Kuta Kafe is likely to be Crowded. You might also seek out locations near the sea. There are a number in the greater Brisbane area. Some include Woody Point on the Redcliffe Peninsular, Shorncliffe and my favourite, Wellington Point. At Wellington Point you can walk out to King Island while the tide is low to watch the moonrise. But remember, as the moonrises its gravitational pull will make the tide rise, so don't linger too long on the island unless you want to wait until dawn to walk back to the mainland. The Gold Coast has many kilometres of beaches but most are angled a little bit north. Instead, try either the spit at the very north of the Gold Coast or Snapper Rocks at the very south for the best easterly views. Don't forget that the adventurous hiker may venture south of the border to Mt Warning to enjoy views from the top of that mountain. The Sunshine Coast and the hinterland just abound with places to watch the moonrise from beaches, islands and mountains. One popular spot among hikers is Mt Ngungun in the glass house mountains, but of course, Wild Horse mountain is a much easier walk for people seeking views. Up in the Hinterland, there are several lookouts facing east that you just drive to. But of course why not enjoy the moonrise from the veranda of the Mapleton Tavern or one of the other restaurants and cafes with easterly vistas in the Montville and Mapleton Area. Townsville of course has Castle Hill, while just short of being a mountain, it still provides views of the rising moon. Otherwise try Kissing Point at the northern end of the strand, though you don't get a perfectly clear view of the horizon to the east from there. The Esplanade Boardwalk is probably the best spot to go if you want to see the moon rise in Cairns. One of my favourite activities during the supermoon is hiking under the moonlight. Townsville is actually one of the better places for this because of the very open and sparsely treed bushland of that area. Up in Cairns, the lush rainforest can obscure the moonlight. In South East Queensland, you are looking for any area that is open. Mt Coot-tha's Powerful Owl and Mahogany Trails are perfect for this. Of course, on the Gold Coast, Sunshine Coast and up in the tropics, you can choose just to stroll along the beach. Don't forget that if you are an early riser, you can also catch the moon setting. You just need to find a place with a nice westerly view for this. Photographing the moon is actually pretty easy. You don't need a particularly fancy camera but you do need one that allows you to adjust both timing and aperture. 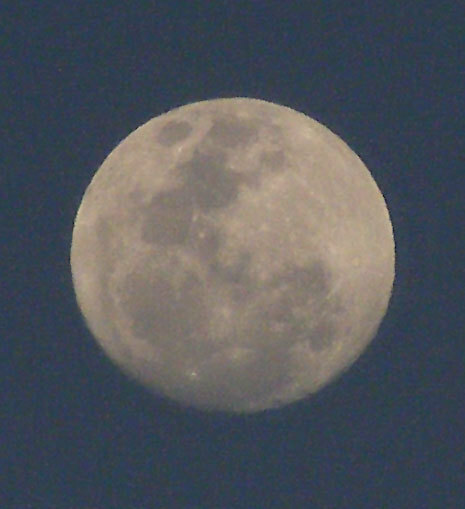 However, if the sky is still light you should be able to photograph the moon even with your phone's camera. For this supermoon, you will have to get up early to photograph the setting moon to do this. 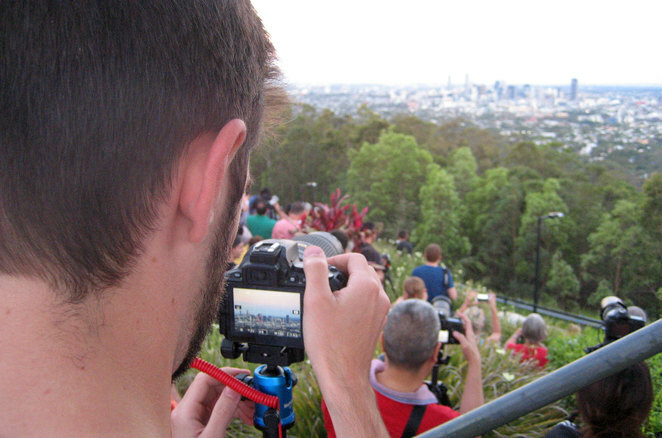 For your manual adjustable camera, set it up on a tripod. Use the timer or a remote to take the photo to avoid camera shudder. Some recommended starting settings for your photos are a f/8 to f/11 aperture and a 1/125 second exposure. Though you should play around with those settings to get the right photo. Part of the process of getting a great moon photo is having the right foreground for the moon to rise behind. This usually means putting a cityscape between you and the moon. 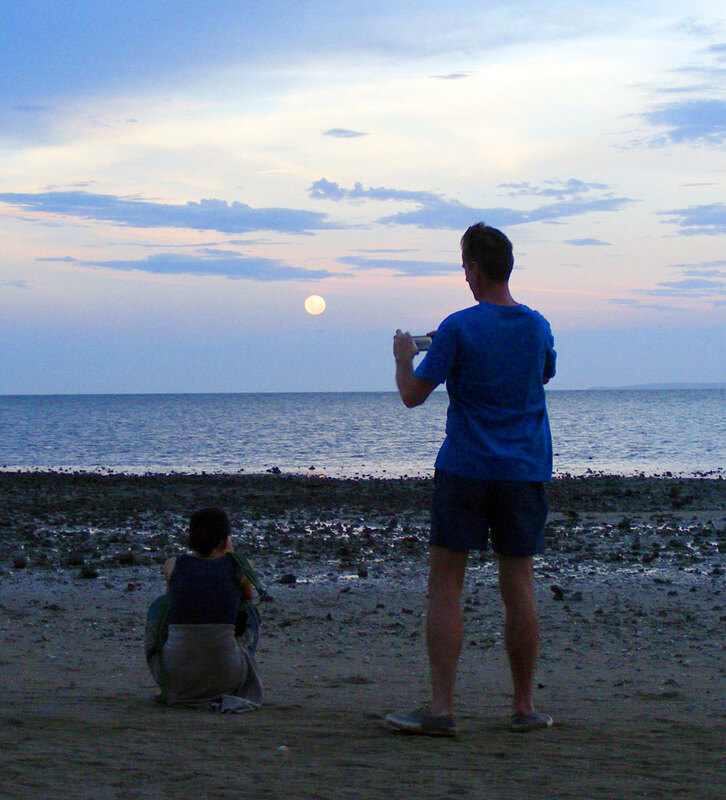 To get the photo right involves a little careful planning to work out exactly where the moon will rise. Remember it will be able 20 degrees north of true east rather than directly to the east.